« Older: Belize at 35: Strong and Together as One! 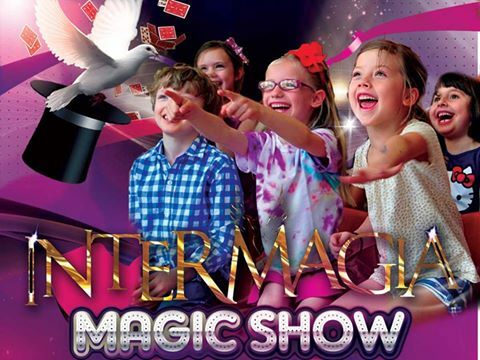 The Rotary Club of Ambergris Caye (RCAC) is excited to announce that Intermagia International Magic will be coming to La Isla Bonita on Monday, October 10th. For the first time, eight members from Spain, Chile, Guatemala, Mexico and Costa Rica will be providing a day filled with mystical magical entertainment and will be performing two shows at the Paradise Theater at 2PM (children) and 7PM (adults). The show will open with San Pedro’s own local tumbling group, The Saints. The RCAC is encouraging the public to join them for this great cause. Tickets are $10 per child, and adult tickets are $50 per person. For $100, you could enjoy reserved seating through “Chairs for Charity.” Reserved ticket holders will be seated in the front row, and will be offered food and beverage service. Proceeds from ticket sales will support RCAC’s Wednesday softball night with the San Pedro Kids Club, along with charity programs with The Rotary Club Sunrise in Belize City. There are only 300 seats available, and you can purchase tickets at Crazy Canucks Beach Bar, Wayo's Beach Bar, or at Keller Williams Realty on Barrier Reef Drive. In addition, all schools across San Pedro are hosting a writing contest in which children can submit a poem that captures the “Magic of San Pedro.” More than 40 complimentary children’s tickets will be given away to the winners of the poetry contest. According to Jeanna Barrett of the RCAC, San Pedro will more than enjoy this unique experience. “Last year, both San Ignacio and Belize City hosted sold-out events that were a huge success, so it’s going to be an exciting event that will bring magic to the island of Ambergris Caye for the first time,” said Barrett. The Rotary Club would like to thank their sponsors: Hotel Central Park, San Pedro Paradise Theater, The Coconut Cafe, Carts Belize, Coconut Carts Belize, Ocean Breeze Cart Rental, Carlo & Ernie's Runway Bar, Aqua Vista Beachfront Suites and The Villas at Banyan Bay. About Rotary: Rotary brings together a global network of volunteer leaders dedicated to tackling the world’s most pressing humanitarian challenges. Rotary connects 1.2 million members of more than 34,000 Rotary clubs in over 200 countries and geographical areas. Their work impacts lives at both the local and international levels, from helping families in need in their own communities to working toward a polio free world. For more information, visit Rotary.